Assure performance through multiple tests with Thermo Scientific™ Shandon™ Microtome Knives. Choose between heavy-duty and PTFE-coated styles of Thermo Scientific™ Shandon™ Premium and Standard High-Profile Disposable Blades. 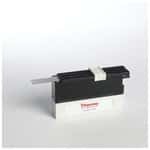 Use Thermo Scientific™ Shandon™ Microtome Knives, featuring a round-back design that is ideal for cryostats. Choose between two sizes of Thermo Scientific™ Adamas Blades for Disposable Magnetic Blade Carriers, available in 60mm and 80mm. Cut with Thermo Scientific™ Shandon™ Standard Microtome Knives, which are thoroughly tempered and individually tested for hardness. Section hard tissues and high-quality thin sections with high-performance Thermo Scientific™ MX35 Premier Disposable Low-Profile Microtome Blades. Experience consistent quality from blade to blade and sample to sample with Thermo Scientific™ Edge-Rite™ Disposable Microtome Blades. Use Thermo Scientific™ HP35 Disposable Microtome Blades for routine applications with a high proportion of harder tissue.